INSIDE : Big news : I have been published in Every Day with Rachael Ray. 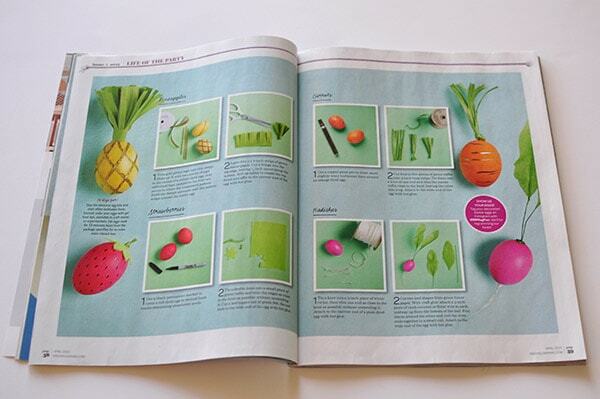 Check out my three page spread detailing how to make my fun food Easter Eggs including a pineapple, radish, carrot and adorable strawberry! Oh friends. I can finally share my little secret! Last October, I was contacted to contribute a few Easter Egg ideas to a piece being written for Every Day with Rachael Ray magazine. It has been a crafting journey that progressively got better and better with each passing month. 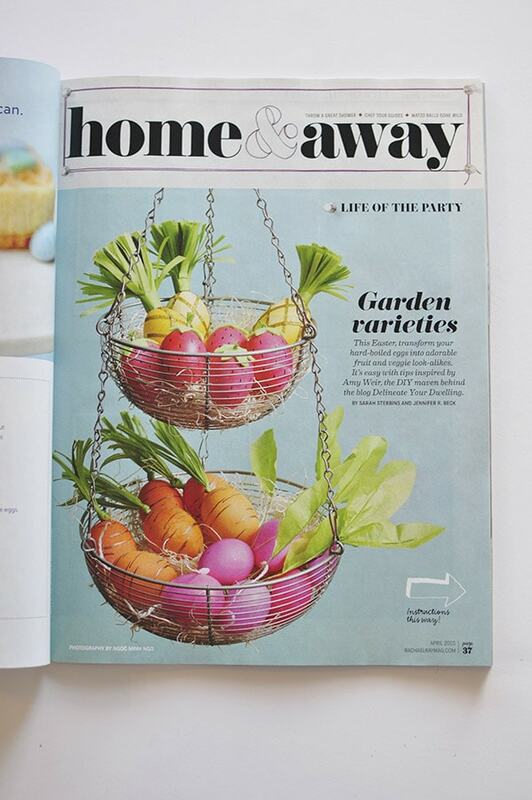 And today I am thrilled beyond words to share that my Easter Egg ideas have been Published in Every Day with Rachael Ray (and three pages)! What started as a compilation piece with many different creative people sharing ideas, slowly turned into a three page spread of my Easter Eggs and I’m honestly as honored as can be. 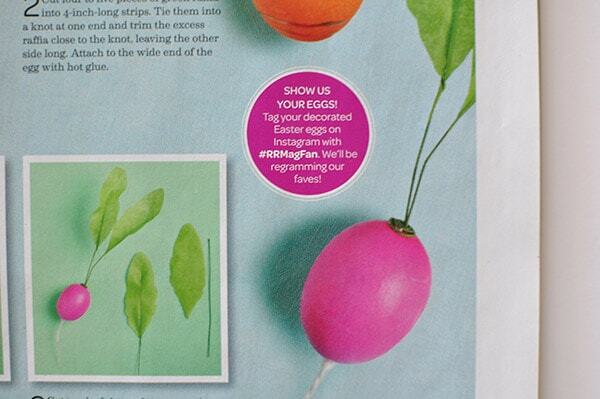 Be sure to tag your decorated Easter eggs on Instagram with #RRMagFan! They will be regramming their favorites. I know, I sure will be! It was such a joy working with all the talented folks on this piece from the writer, Sarah Stebbins, to getting such constructive feedback from Jennifer, the editor. I also shared some Behind the scenes of the process, from design to magazine! So you can just find me doing a happy dance and smiling nonstop. Be sure to pick up a copy of Every Day with Rachael Ray to read the full piece at your local store! Adorable and very tempting to eat Easter eggs. Couldn’t be more proud and “egg cited” for you, Amy. Happy Easter to your family. Thank you for your continued creativity and blogging. Aw, thank you so much for your kind words Candae! Happy Easter to you all, too!! Congrats!!! I’m so excited for you! It’s well deserved. Your eggs are the cutest! Thanks so much, Sarah. It was so fun working with them on my ideas! Congrats on your feature! Can’t wait to see the bts and hear more. Thanks for sharing your post at the party! Woo- hoo!! Congrats!! That’s HUGE! Ah, thank you SO MUCH Marni!! Haha, you are MUCH TOO KIND Miss Deonna! I’m so glad my secret is finally out, phew. WOOOOOOOOOOOHOOOOOOOOOOOOOOOO!!!!! How exciting for you!!! Your eggs are the very best I have ever seen – would love to do these with my granddaughters!!! Doing the happy dance for you!!! Amazing! So happy for you and I can’t wait to try to make these darling eggs. Cutest I’ve seen. Totally magazine worthy. Congrats! Oh, thank you so much Carrie!! It’s all quite surreal! Such amazing news Amy! Those eggs are so stinkin cute and deserve to be in there! CONGRATS! Oh, Bre! Thank you so much for your kind words!! CONGRATULATIONS Ames! These are so cute! So creative! What a beautiful spread in the magazine. We’ll all be saying ‘I knew her back when…’ 🙂 I think this will keep you on cloud nine for awhile. Shelley, stop it now or I am going to cry! Thank you for your kind and loving words. Means the world. This is HUGE Amy!!! You did such an amazing job- cutest eggs I’ve ever seen. CONGRATS!! Oh thank you, Amy! It was such a crazy process but now that it’s all over, I couldn’t be happier with the results. AMY, yay I am so excited for you, and I love love love how it turned out. You are on the right track lady. Congrats. Aw, such kind words Bettina! Thank you so much. Thanks so much, Anika! Everyone in the country was busy baking their Thanksgiving turkey and I was working feverishly on easter eggs, ha! But, now it’s all worth it!! Congrat, congrats, congrats!! Those eggs are so stinkin cute. You did a fabulous job! So excited for you, friend! Thanks girl! It was the hardest secret to keep, but so so much fun to make! So awesome!!! And the eggs look amazing! Congratulations, Amy!! What an honor, Amy! I’m so excited for you and holy cannoli how cute is your spread?! Congrats! I’m smiling so big right now! This is so amazing Amy. 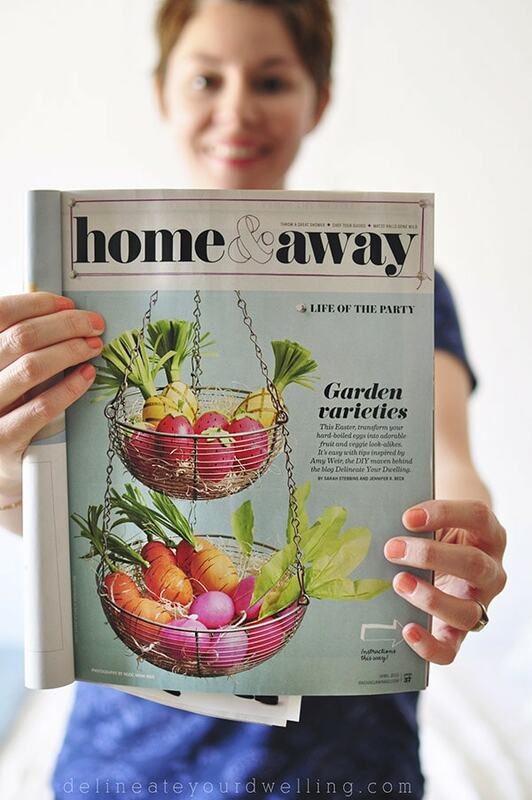 You did a fantastic job creating such a fun project that is absolutely magazine worthy! So proud of you. Aw, thanks so much friend! I was smiling pretty big, too – ha! That is awesome.It looks great! Rachel Ray doesn’t know it yet but we are related on down the line! Suzie, so fun! Thanks for stopping by and happy Friday! SO, SO exciting Amy!!! LOVE what you came up with girl! Congrats! Thank you, Kristi! It all started after I did my pineapple pumpkin last fall… I had fruit on the brain! Ha. Congratulations on the fruits of your labors! And the vegetables. Thank you so much, Christine!! Very surreal for me, ha.